Chinese President Xi Jinping said on Monday that the new leadership of the Communist Party of China (CPC) Central Committee will work with the Lao People's Revolutionary Party (LPRP) to strengthen political guidance for closer bilateral ties. BEIJING, Oct. 30 (Xinhua) — Chinese President Xi Jinping said on Monday that the new leadership of the Communist Party of China (CPC) Central Committee will work with the Lao People’s Revolutionary Party (LPRP) to strengthen political guidance for closer bilateral ties. Xi, also general secretary of the CPC Central Committee, made the remarks when meeting with Sounthone Xayachack, head of the LPRP Central Committee’s commission for external relations, who visited China as the special envoy of Bounnhang Vorachit, general secretary of the LPRP Central Committee. “The ruling parties of China and Laos should bear in mind the strategic significance of bilateral ties from a higher perspective and a deeper level, so as to contribute to the development of the two countries as well as the world socialist development,” Xi said. “Socialist countries including China and Laos have been making tireless efforts to explore a development path that suits its own conditions, and have made remarkable achievements,” he said. 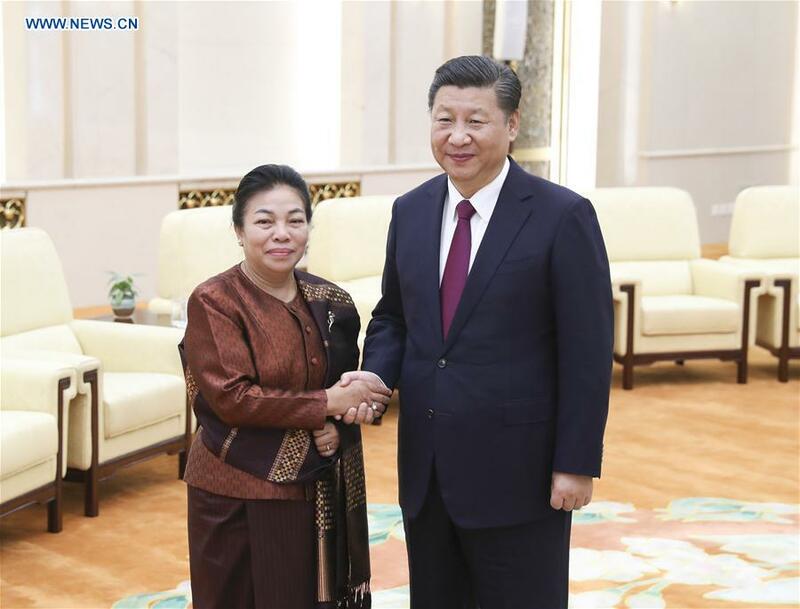 Xi also expressed appreciations for Sounthone’s visit and a congratulatory letter from Bounnhang she brought with, which he said “demonstrates the friendship between the two parties and the importance that the LPRP attaches to the ties between the two parties and the two countries”. In the letter, Bounnhang sent warm congratulations to Xi on his re-election as the general secretary of the Central Committee of the CPC and the successful conclusion of the 19th CPC National Congress. Sounthone said the LPRP Central Committee hoped to work with the new leadership of the CPC Central Committee with General Secretary Xi Jinping at its core, to bring the comprehensive strategic partnership of cooperation between China and Laos to a new height in the new era.